Winner/Colome Legion baseball team fell in two games in the state Class B tournament in Webster. On Friday afternoon, Milbank defeated Winner/Colome 6-2. Kelly O’Bryan started on the mound and went 8 innings giving up 5 runs (3 earned) on 10 hits, 2 walks and 7 strikeouts. Drew DeMers pitched the 9th inning giving up 1 unearned run on 1 hit. Drew DeMers and Levin McClanahan had RBI singles. The Royals and Milbank had met twice before during the regular season with each winning a game. 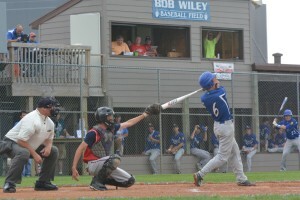 The Winner/Colome Legion played in Saturday’s elimination game and fell 7-3 to Madison. For Winner/Colome, Carter Brickman started on the mound and pitched four innings giving up 3 runs on 6 hits, 1 walk and no strikeouts. Reed Harter came on in relief and pitched four innings giving up 4 runs (2 earned) on 4 hits, 1 walk and 5 strikeouts.